If you think you might benefit from custom made foot orthotics or simply want to learn more about them, we suggest that you read the following information and give us a call at 905-951-7051 if you have any questions. When might orthotics help you? How do orthotics help you? Custom Orthotics provide relief for painful foot problems or an injury, especially for those who must walk, or stand excessively on the job or in every day activities. They help to maintain the normal positioning of the bones in the foot, the joints in the ankle and knees, which in turn, help align the hips and lower back. The muscles and ligaments holding these bones in their intended anatomical positions are prevented from over stretching over time. Aside from aligning the foot structure, the Custom Orthotic reduces muscular fatigue and helps to promote more efficient muscle performance, enhancing propulsion during the gait cycle. 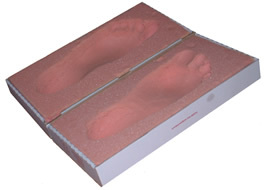 Your individual foot shape is captured in a foam measuring system. The orthotics are then fabricated, using these measurements, by state-of-the-art computerized equipment in a specialized laboratory, based on your specific requirements. They are made from a variety of materials, depending on your specific condition, activities, occupation, physical stature and the types of shoes in which you will be wearing them. This system is an effective diagnostic tool for assessing standing and walking biomechanics. The scan system has an industry high 4096 sensors and its software makes is easy to communicate to the client, the insurer and the family physician regarding an accurate analysis of the client’s individual gait pattern and foot pressures. Custom made orthotics are made from measurements that are taken by a computer while your feet are in motion and weight bearing. As you walk across a mat that is connected to a computer, the mat’s 960 electronic sensor points scan your moving feet at a rate of 30 times per second, taking incredibly precise measurements throughout your footsteps. Information on the way your feet touch the ground, and how you distribute your body weight, is collected. This information is analyzed by the computer to produce instant 2D and 3D graphic images of your feet that you can see on the screen. The same information is then fed via modem to sophisticated diagnostic software that specifies the orthotics. Within days, the orthotics are on their way to our clinic. MaxxLife™ premium orthotic, from Footmaxx – offers a high level of comfort and biomechanical control. Features include a genuine leather top cover and a full-length suede bottom. SuperFlex orthotic from The Orthotic Group – versatile orthotic that can be worn in most shoes, including casual shoes and sports shoes. We also offer a sied variety of both Men’s and Women’s shoes that come with your custom made orthotic. 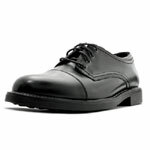 Brand name include Clarks, Mephisto, Bostonian, Naot, Merrell and many others. A 2002 study concluded that custom semirigid foot orthotics may significantly reduce pain experienced during walking (by 66%) and may reduce disability (by 75%) for patients with chronic plantar fasciitis. Researchers determined the impact of custom semirigid foot orthotics on pain and disability for individuals with plantar fasciitis. Eight men and 7 women (mean ages 44.7 years) who reported having plantar fasciitis symptoms for an average of 21.3 months, participated in the study. Subjects were timed for a 100-m walk at a self-selected speed, then they rated the pain they experienced during the walk using a 10-cm visual analog scale. Subjects also completed the pain and disability subsections of the Foot Function Index questionnaire. All measures were acquired before the fabrication of custom semirigid foot orthotics and 12 to 17 days following onset of foot orthotic use. A 1998 study involved 85 patients with plantar heel pain and found that after 12 weeks of treatment with custom orthotics, 70% of the patients achieved good to excellent results. In a 1996 study, thirteen subjects with an acute inversion ankle sprain and 12 uninjured subjects were assessed for postural sway on a balance system under two treatment conditions (orthotic and nonorthotic) and four platform movements. It was found that postural sway with orthotic intervention improved significantly more in injured subjects than in uninjured subjects. This research suggests that custom-fit orthotics may restrict undesirable motion at the foot and ankle and enhance joint mechanoreceptors to detect perturbations and provide structural support for detecting and controlling postural sway in ankle-injured subjects. A 2000 study revealed that patients with rheumatoid arthritis (RA) showed a significant reduction in pain and a decrease in foot disability when they wore custom foot orthotics. (Chalmers AC, Busby C, Goyert J, Porter B, Schulzer M: Metatarsalgia and rheumatoid arthritis-a randomized, single blind, sequential trial comparing two types of foot orthoses and supportive shoes. J Rheum, 27:1643-1647, 2000.) A randomized trial of 40 children with juvenile arthritis found that the children who were provided with custom made orthotics, had significantly greater improvements in reduction of pain, speed of ambulation, and level of disability compared to those in the study that received shoe inserts or shoes alone. (Powell M, Seid M, Szer IA: Efficacy of custom foot orthotics in improving pain and functional status in children with juvenile idiopathic arthritis: A randomized trial. J Rheum, 32:943-950, 2005.) In a 2003 study on patients with rheumatoid arthritis, those who wore foot orthotics showed significant reductions in rearfoot eversion during stance and also showed a reduction in internal tibial rotation after a 12 month period. These two biomechanical effects help contribute to more balanced pressures on the entire lower limb, decreasing symptoms. A 2003 study found that treating excessive pronation in children with custom made orthotics, reduced the “growing pains” affecting the legs of these patients. A study in 2003 looked at 102 athletic patients with patellofemoral pain syndrome, and found that 76.5% of patients improved their level of pain, with 2% being completely asymptomatic after 2-4 weeks of receiving the custom foot orthotics. (Saxena A, Haddad J: The effect of foot orthoses on patellofemoral pain syndrome. 93:264-271, 2003.) A 2005 study of 30 patients with medial knee osteoarthritis who were given foot orthotics with a 5 degree lateral wedge, found that after 6 weeks, all subjects had some pain relief. Patient Satisfaction with Foot Orthotics – 275 patients treated at the Foot and Ankle Institute at the Temple University School of Podiatric Medicine in Philadelphia, Pennsylvania, were surveyed regarding their satisfaction with custom made foot orthotics. All patients had their orthotics for more than one year. The majority of respondants reported between 60 to 100 percent decrease in pain or other symptoms. This study suggests that custom made orthotics are and effective treatment associated with a high level of satisfaction.